Our client wanted his Christmas card to look a cut above the others sent by his competitors. After discussing this with his Kolorco Account Manager he came up with a 250 card print run, printed digitally using the excellent printing power and super sharp resolutions afforded by Indigo digital print technology. The green background was printed with liquid inks giving a solid coverage which cannot be achieved with lesser systems. 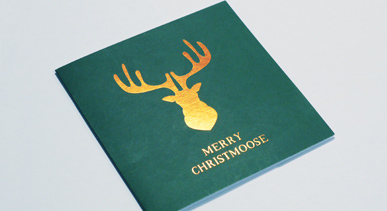 After printing the cards they were gold foiled for a high end finish. For more information on this project and many more please call one of our team on 01274 613566.